Register for GTM’s California’s Distributed Energy Future event to be a part of the conversation. California Gov. Jerry Brown gave an impassioned speech on Tuesday, rejecting many of the conservative policies championed by the Trump administration and Republicans in Washington, D.C.
“California is not turning back. Not now, not ever,” said Brown during his state-of-the-state address. He focused his speech on fighting for immigrant rights, protecting healthcare and continuing to act on climate change. “Our state is known the world over for the actions we have taken to encourage renewable energy and combat climate change,” said Brown. Many in the environmental community and cleantech industry will be looking to California, which represents the sixth-largest economy in the world, to continue leading the clean energy transition during Trump’s presidency. The new administration has already pledged to undo federal regulations on climate change and proposed budget cuts for the Environmental Protection Agency and the Department of Energy. Trump also took executive action on Tuesday to advance the approval of the Keystone XL and Dakota Access pipelines. California has already taken major steps to act on climate, including the approval of a 50 percent renewable energy target. The only flaw with that target is that it wasn’t ambitious enough, California Senate leader Kevin de León recently told The Los Angeles Times. California is already moving toward a clean energy future faster than expected and should “explore the idea” of a 100 percent renewable energy target, he said. 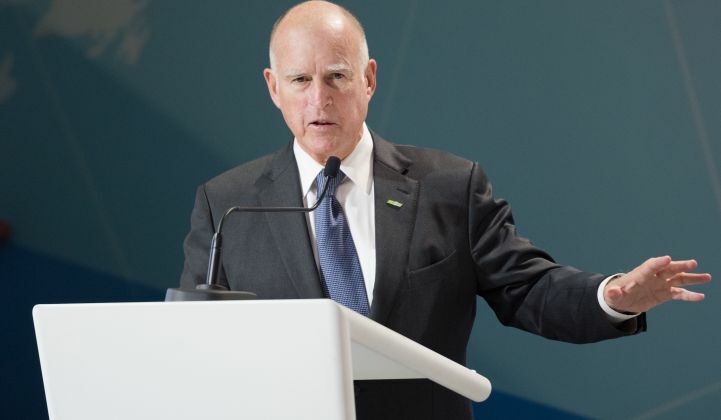 In addition to California’s renewable energy portfolio standard, Governor Brown has set a goal of installing 12,000 megawatts of distributed generation in the state, defined as projects under 20 megawatts. As of October 31, 2016, nearly 9,400 megawatts of distributed generation capacity was operating or installed in California, with an additional 900 megawatts pending. That total includes almost 5,100 megawatts of solar self-generation capacity, which far exceeds the state’s goal of installing 3,000 megawatts of solar energy residential and commercial sites by 2017, according to a recent report by the California Energy Commission. California’s programs to support renewable distributed generation could add another 1,800 megawatts if fully subscribed, the report states. Distributed energy resources have become an important element of California’s fight against climate change -- as well as an important part of the state's economy. To facilitate growth in the sector, state lawmakers and regulators have introduced myriad programs and policies aimed at the integration of distributed energy resources. At the same time, the private sector has come up with new technologies and business models to better manage distributed energy resources on the grid. On March 8-9 in San Francisco, Greentech Media is hosting a conference on the future of electricity in California -- one of America’s most innovative states. California’s Distributed Energy Future (CDEF) will kick off on March 8 with a pre-conference workshop in collaboration with More Than Smart. The workshop will give attendees the opportunity to review the stakeholders in California’s clean energy sector, catch up on the latest policy developments, and discuss distributed energy terms and concepts in an interactive half-day session. On March 9, GTM will host a full day of panel sessions, taking a deep dive on topics such as rate design, community-choice aggregation, electric vehicle infrastructure, and distributed energy financing. The conference will feature insights from GTM Research and industry experts, including the California Public Utilities Commission, Southern California Edison, SolarCity, Siemens and many more. California can act on clean energy and climate change on its own, and in partnership with like-minded states, said Gov. Brown in his address. “Make no mistake -- we’re going to do exactly that,” he said. Register to attend CDEF here to be a part of the conversation on the future of distributed energy resources in the Golden State.